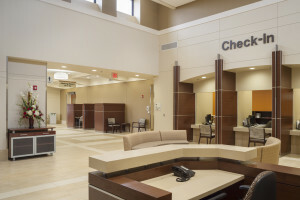 In September 2011, US Federal Properties (USFP) was selected to develop a 22,350 square-foot state-of-the-art Outpatient Clinic for the Department of Veterans Affairs (VA) in Laredo, Texas. The site selected for the clinic, which incorporates a warm and inviting appeal, is central to the University of Texas Health Science Center’s regional master plan. USFP designed the facility to support a healing environment in which to deliver modern healthcare, but also to blend with and enhance the appearance of the entire medical campus. The project was completed in August 2013, with the facility being completely operational and providing services to patients shortly thereafter. The Laredo VA Clinic meets LEED Silver Certification criteria, having been developed with sustainable design and energy efficiency features for water, electricity, indoor air and materials, recycling and storm water quantity/quality.